Previously I had written an article on data recovery software known as Recuva. Well, today, I’m going to share with you’ll yet another application which does the same job- DiskDigger. It’s a portable data recovery software which helps you to recover deleted files from your computer. The software limits the recovery to three file types images, documents and multimedia. 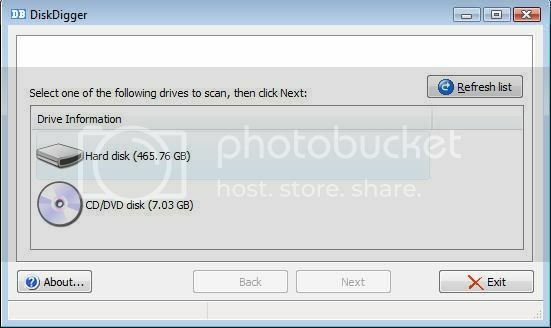 Well, this might be a serious drawback but there’s an advantage as well, it is easier to find and recover deleted files if they belong to any one of the above three types. DiskDigger has an extremely user friendly interface. Once started it displays all the hard drives and removable drives that are connected to the computer. On the next page you’ll see a checklist of various file types that can be recovered. The checklist is divided into the three categories- photos and images, documents and Audio & Video. You can select the ones you want to recover and uncheck the rest.